Our team is comprised of some of the nicest people you’ll ever meet, and they just so happen to be highly-experienced dental experts! You’ll learn to love them from the first time you call in to schedule an appointment, and they’ll make sure your visits glide by smoothly from check-in to checkout. Read on below to learn more about our fantastic team! Robbie’s experience in dentistry spans 18 years and counting. She attended the University of Tennessee at Chattanooga. Getting to know all of the patients so well is the best part of her job. She has grown to love them like family! Originally from Chattanooga, Robbie is married with one son. In her free time, she enjoys watching her son play sports, volunteering, traveling, and practicing photography. Jane may be a relatively new member of our team, but her experience in the oral healthcare field covers over 30 years! She achieved her Bachelor of Science in Dental Hygiene from West Virginia University and regularly attends continuing education classes/seminars in order to keep her skills up-to-date. She is CPR-certified and attends the Hinman Dental Society meeting yearly. She really enjoys spending time in the calm, professional atmosphere at Dream Dental. Originally from Elkview, WY, Jane is the proud mother of three young adult children. She spends her free time working out at the gym, going on social outings with her friends and sisters, reading, watching home renovation/decorating shows, and keeping up with college football – go Mountaineers! Funny enough, she has an identical twin who’s also worked as a dental hygienist! 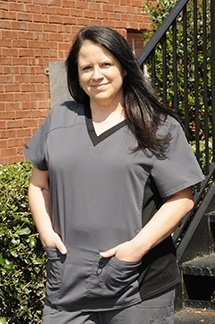 Wendy is from Sylvania, GA, and she’s worked in the dental field for over a decade now. What she enjoys most about her position is being able to serve Woodstock and the surrounding areas with the care patients needs to achieve dental wellness and confidence. She is EFDA-certified, CPR-certified, and X-ray-certified. Wendy has been married for almost 20 years and has two children, as well as a dog named Bella. Her hobbies outside of work include gardening, interior decorating, cooking, bicycling, and walking along hiking trails in Georgia. She also loves the beach!